Marshall Thompson hatched the idea for a taco cart last year, and despite several spools of red tape and setbacks, he had it up and running late last summer. 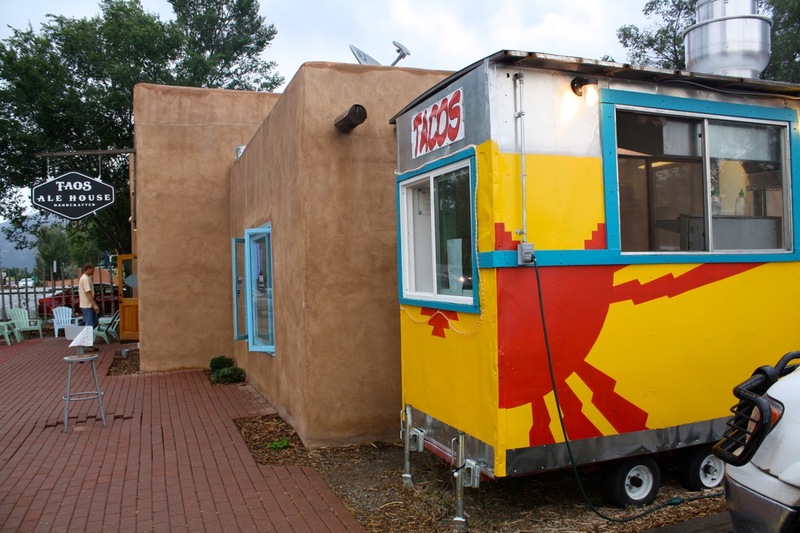 Thompson first parked his taco cart in the alley between Hotel La Fonda and Taos Mountain Outfitters; later, he moved it to an interior corner on Taos Plaza. The new home for the cart, now named Gringo Taco, is the parking lot at the Taos Ale House. After much more red tape, mechanical and equipment issues, the cart being toppled by one of last spring’s strong winds, having Gringo Taco anywhere is proof of Thompson’s profound love of making food, dogged will and his self-admitted cockiness. When the cart blew over, Thompson thought hard about all the money he had already put into the cart. He made the decision not to jump through any more hoops to be on Taos Plaza. When the folks at Taos Ale House approached Thompson to run a cart for them, Thompson countered with an offer to park his own cart there. The deal was struck. A “proud East-Coaster” who studied culinary arts at Johnson and Wales University in Providence, R.I., Thompson has been cooking around Taos and living in Arroyo Seco long enough to consider himself an honest local. He’s put that localness into Gringo Taco. Locally-grown food, indigenous ingredients and Thompson’s personal spin give Gringo Taco’s menu a unique Norteño flavor. 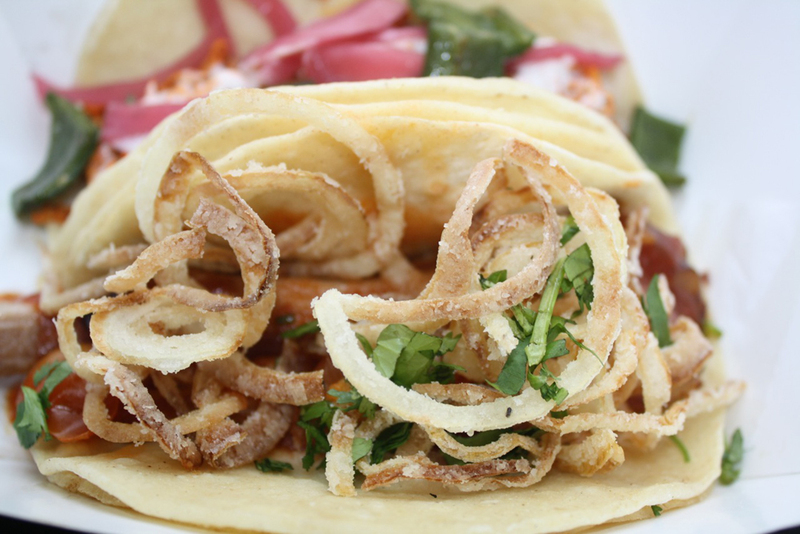 The pork confit taco with smoked cherry tomatoes and fried onions features an apricot-habanero barbecue sauce. The locally-raised brisket is rubbed with coffee and cacao, smoked in-house and paired with cotija cheese and chokecherries. The achiote chicken taco has locally grown shishito peppers and pickled onions. The onions are a nod to the tradition of preserved food. There are also tacos with trout, tempeh, black beans, and crimini mushrooms. In addition to tacos, Gringo Taco’s menu has a black bean and quinoa side dish, and appetizers like herb marinated and cured shishito peppers. The tacos are remarkably affordable. Taco prices range from $3.50 to $4.50. They’re $2.00 during happy hour. At $9.50, the smoked duck green chile stew with white beans, zucchini, and carrot is the most expensive item on the menu by a long shot. The base for Thompson’s tacos are essentially the same as what you might find somewhere else: chicken, pork, beef, and fish. But breaking the rules was a conscious choice. Thompson says everyone else serving the same food is using ingredients that are rolled off a big truck from Albuquerque. “The tortilla is just the vessel. What’s inside can be anything you might find at a bistro,” says Thompson. 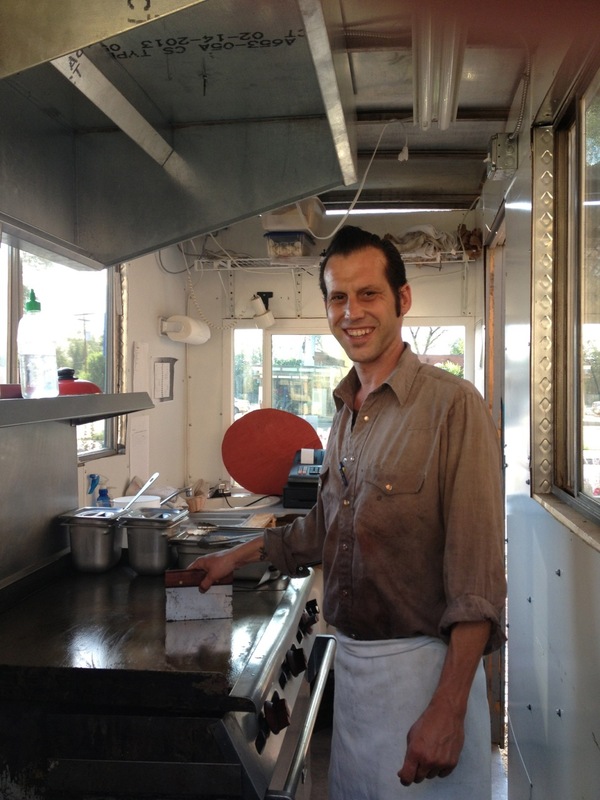 Thompson has been running his Great Noodles cart at the John Dunn Shops since May 2009. Great Noodles serves spring rolls and noodle dishes inspired by Thai and Vietnamese flavors and ingredients. The noodle cart is wildly popular, and frequently has to close up early after selling out of food. Because of its success, Great Noodles doesn’t need as much of Thompson’s attention as Gringo Taco. Thompson will spend more time at Great Noodles and with its loyal customers when Gringo Taco is more established. Which, despite its challenging history, will happen eventually. “I’m an optimist,” says Thompson. 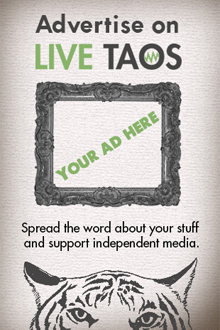 Get great Taos tacos at Gringo Taco, now located in the parking lot of the Taos Ale House, 201 Paseo del Pueblo Norte, across from the Taos Post Office.